This little lady will be making her debut in CA later this month in front of 400 people! My Princess friend in Vegas - Sandra wears a few of my costumes. 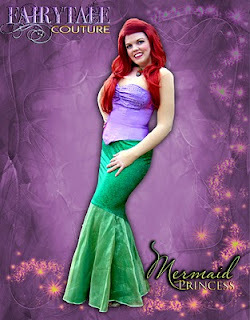 Here she is in one version of Fin Mermaid! I would love to showcase more of my costumes in action. If you have a picture to share email me! While I'd like my costumes to last forever they just can't. Here is a replacement skirt for a Sleeping Beauty. The original did last 3 years .